Gatto stars for New Jersey powerhouse, St. Augustine Prep, a team loaded with next level talent. Even on such a talented roster, the 6-foot-5 right-hander shines bright. He comes armed with a 92-94 mph fastball, and has a quality curveball and changeup to go with it. 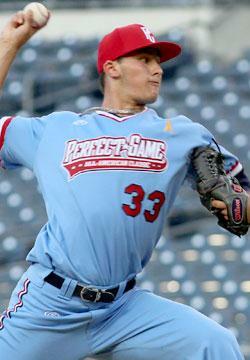 Gatto has also impressed scouts with his easy velocity and big league frame. This is the second year in a row St. Augustine Prep will have a PG All-American, following Chris Oakley’s 2012 appearance.